We are really enjoying rather pleasant weather in Lexington these days. 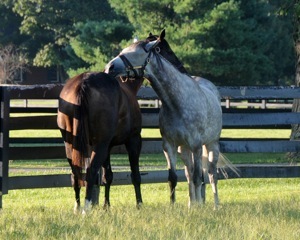 My pal, Tasty Temptation, and I were out in our paddock and suddenly we decided we would ‘scratch each other’s back’. As you can see, Mathea was there just at that moment and took the perfect photo of us. I scratched TT’s back…and she sweetly gave me a nice little back rub at the same time. I must say that she and I are really dear friends. We get along beautifully. I know about TEAMWORK…as I have been part of a TEAM my entire racing career. Thus, I know how truly important it is to work together to achieve goals. It is so nice to have a friend there to help you out when needed. I still have dapples and a very pretty coat. I am truly one very healthy horse! Also, I do love MY EARS! They are rather expressive...if I say so myself. @Jackie—Thanks for the link to the article about Noor and how his trainer brought out his best through the gentlest treatment (sounds like our John). The photo of Burley Parke nuzzling Noor is so touching. @judy berube – thank you for your well wishes and the link to Barbara Livingston’s latest blog. She knows how to capture the aura that is Saratoga. @Margie – thank you, I went from Navy Vet to hopefully Vet Tech!! @Carole #42 – good luck to your daughter. It makes it easier to learn when you enjoy what you’re studying. Are your standardbred and quarter horse ex-racehorses? @Trina Nagele and Marshall (girl’s name) – thanks for your support!! @Georgia Harper – thank you for your well wishes too. Yes, it is very satisfying and a blessing to be given the chance to pursue your dreams. @LauraJ – thanks for the link. The info is very interesting. @Barbara Wood – thank you for your kind words. @Judy Berube—Thanks for the link on Havre de Grace. Hope she wins on Saturday! @Margaret—I’m truly delighted that you liked that little poem. I’m still wondering about the date, but I’ve got it close enough for next year if you’d rather keep that quiet. That is just the sweetest picture of you and TT! Sleep tight, sweet Z, till the morning light. Good Morning Zenny, I am hoping for another pleasant day at LE for you and Tasty T with lots of scratching and munching together. Today you will have lots to think about as Noor’s return to his birthplace will be officially celebrated at Old Friends. How nice it would be if Charlotte, Kathy, and friends could drop in to see you when they are so close. It would be a wonderful way to thank them for all their efforts on behalf of Noor. Good to see you looking so healthy and happy. Good morning, Dear Z–I hope you and your BFFs can find some fun things to do today. @Marshall(girl’s name)– Kathryn Cogswell and Diana S are fine–just busy right now. I believe KC is in the process of moving. Still concerned about Catherine Uher, though, and Amanda Gilliland. @Arlene–prayers for energy and decision-making for you as you clean up. If you can, please keep us updated. @Sunny Boyd–still lol about the sausage/laws quote. @judy berube. Thank you for the link to the Saratoga photos. Very beautiful. Loved the ones of the horses rolling in the dust having fun, but they were all good and they make you feel good too. I found this film clip on Noor’s FB page & it features our Charlotte Farmer!!!! Good Morning Pretty Lady Z. Isn’t it great to have a friend? I don’t know what I would do if I did not have my friends. They are a gift from God. Enjoy this beautiful weather and all of your friends both equine and human. We love you so much and enjoy seeing you enjoying life. Hugs and plenty of back rubs. I love back rubs. They make me/you feel so good. @Karen Gogue~ Your final words for Noor…priceless. Thank you. Ahhh how sweet it is to have such a good friend to scratch your back! Hope your weekend was uneventful. We on the east coast are still in recovery. Just got power. Lots of trees down on power lines and storm surge. @ Max: I thnk that is why the Mosses named one of their horses UTOPIAN! How wonderful to have a good friend to share back rubs with! @Abigail from Montreal–thanks for the Noor/Old Friends link. OMG-Z! That is the Cutest photo of you & TT! We have had no power due to Irene and we just got it back and had to check up on our favorite girl! Glad to see all is well! I agree, your ears are gorgeous! That is a very special picture…thanks for sharing, Mathea! Yes, friends hold a very special place in our hearts! Team Z – the best team! And yes, those are wonderfully expressive ears!! Beautiful ears, beautiful dapples, very beautiful “baby bump”. Love you Z.
Catching up on missed post. TT is very lucky to have a friend like you. Take care. Love you. I met a Zenyatta fan at Del Mar last Sunday. He had an entire notebook full of Zenyatta photos and keepsakes. It was great! Zenyatta, and Tasty Temptation…. Two Real Beauties!!! Friends are so Wonderful to have!!! 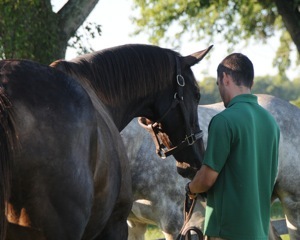 This picture should be part of a calendar for fundraising for the various needs in the horseracing community!! !